Dominion: What is an engine? | Wake up, Meeples! Dominion: What is an engine? It’s been no secret that I’m not the biggest fan of the term “engine” when it comes to Dominion. I used to use the term quite a bit, but when I talk to people about building those types of decks in Dominion, I find that it’s not a very “instructive” term to use. What does that mean? Mostly that it’s hard to tell someone who doesn’t already understand the concept and have them understand, and I can’t find any sort of definition that gives insight into real games of Dominion like I can with villages or draw. On top of that, the term “engine” is overloaded, meaning that in lots of different types of games it can mean various things. All of this adds up to “engine” being intimidating to some players who are trying to get comfortable with building more complex decks. But enough about why I don’t like the term, what I really want is to bridge the gap between someone who doesn’t know what an “engine” is, and someone who is very good at the game and able to effectively communicate using the E-word. I want to dig in and figure out all of the things that people can mean when they say “engine”, and figure out some way to make that information accessible to the people who can use it. I’ve taken enough time to whine about people using the word identify the problems with the word and it’s time for me to do what I can to actually suggest better ways to communicate. So I made a Google form and had some help putting links to it in lots of places online. The form just asked people to write down what they meant when they said “engine,” and hopefully we can get some insight from these responses. I wasn’t entirely sure what I was looking for going into this, and I certainly wasn’t thinking that a coherent definition of the term could come out of it, but maybe there’s something in the data that can teach me and others something they didn’t already know. Without any more intro, here’s a link to the spreadsheet containing all of the results. With a little bit of help, I tried to come up with key points that were found a lot among the answers to try and find the most common ideas. There were 67 (serious) responses to the question, and as expected, there doesn’t appear to be a consensus — the most common key point wasn’t even mentioned by half of the people who responded. I’ll show a chart of the results of this, explain what each of the key points means, and give a few brief comments for now. Draws/”cycles” a lot: Describes decks that either draw all of their cards, draw most of their cards, and/or are able to play their most important cards each turn. Plays a lot of stuff (actions): Describes decks that play a lot of cards on a typical turn, specifically action cards. Buying power/payload: Describes answers that refer to building a bigger-than-normal payload. Growing: Describes decks that are able to increase their abilities rapidly. Actions (villages): Describes decks that make use of “additional actions” or the village-effect. Good/win game: Describes decks that have a goal of winning the game, or the best deck that can be built on a given kingdom. Synergies: Describes decks that aim to use cards that work well together. Everything below this point will be my own personal commentary on the data. It’s just high-level stuff at this point because I kind of want to wrap my head around some of these concepts before making any real content based off of it, but I’ll at least give an idea of what kind of content I’m thinking about when it comes to this stuff. So my goal here is to come up with instructive things to tell people who don’t know what an engine is. I’m trying to get as much value as possible out of the data here, so let’s see how we can look at this to learn stuff. First, if you just look at what the more common answers are, you can see the general ideas people are trying to get across when they say “engine” — a deck that draws itself, plays a lot of stuff, and has big turns. After seeing multiple discussions attempting to find a “cohesive definition” for the term, I’m pretty convinced that it’s not worth doing, though. I’m not saying that the word has no value, but I’m saying that it has so many different meanings that some context is needed to help nail down what “engine” means if one wants to use that word. Everyone has a different mental model of Dominion (well, everything actually) and I just don’t think building good decks in Dominion is simple enough to have everything captured by metrics as simple as these. The more an individual plays Dominion, the more sophisticated their mental model of the game becomes, and so it’s much more difficult to describe it simply. It’s pretty clear that any attempt to take shortcuts in talking about good decks in Dominion is going to leave out enough detail that the point just isn’t getting across — it’s not doing justice to the diverse set of mental models that make up the thousands of people who are very good at Dominion and have a relatively deep understanding of how to make good decks. The fact that there are many definitions of “engine” in this data set that make a lot of sense, but address completely different aspects of deck building, shows that without some context, a single word is just not enough to get the point across. I could continue to gripe about why I don’t think using the E-word is all that great in lots of circumstances, but that was never the point of this poll. The point was for me to try and understand what value there is in the knowledge contained within the “conventional wisdom” of the advice “build an engine” — advice I gave for years and years to people, right before I watched their eyes glaze over. So what can we do that’s constructive? How can we get these concepts across to people who don’t already know what everything means? Well I think it’s worth sorting through these categories to find the ones that can be talked about in detail, and I’ll start by eliminating the ones that aren’t instructive. Let me say something about these key points that aren’t instructive. Just because they aren’t instructive doesn’t mean they are wrong. I wouldn’t disagree with any of these, but I also wouldn’t say any of these as a response to someone who asked me how to get better at the game because I don’t think they serve that specific purpose. Good/win game: This one seems like it has the least instructive value. People already know that they want to build good decks and win the game, and I don’t think anyone out there truly believes that the best deck on every single kingdom out there involves “building an engine” in the same sense as all of these other key points describe. Not Money: “Big Money” decks are always technically possible to build, but they suffer from some of the same problems with definitions as “engine” decks do. Many mental models of the game force all decks into the “money” category and the “engine” category, but this key point seems to me as just a symptom of the idea that “engine” is just a shortcut word that tries to leave out a lot of detail where it’s really needed. Since the whole point is to be able to talk about that detail without the shortcut, I don’t think this metric is going to be helpful there. There are seven key points left after I take these out. Seven things that describe decks that I think everyone would agree are very good decks to build. Each of these seven key points are intertwined in a way that it’s very difficult to untangle them completely, but you can look at these and try to use them to come up with goals for a particular kingdom. More importantly, when you’re doing something good, you know why; and when you’re looking for strengths and weaknesses of “engine” decks you want to build, you can identify what they are, how they will affect you, and how you may be able to use other tools to compensate for them. I want to work these core concepts into future content that I make — most likely podcast episodes (since that’s like, all of the content I’ve been making these days). Talking about these things without the context of a kingdom at least makes sense to me, even if I don’t quite use the exact same words as these key points of the definitions they came from. These things are hallmarks of many good decks you can build. In spite of the fact that some of these aren’t really defined that well (I’m looking at you, consistency), there’s room for discussion about these concepts, and these concepts can be referred back to when you have a kingdom in front of you and you want to identify the tools you have to address each of these things. Now I have an idea of what that deck does and why it’s good, and I don’t have to use so many words to compare it to this delicious Bureaucrat/Silk road deck that I might label “slog.” Establishing the shortcut before using it can make communication more effective, and could even be useful for distinguishing decks that are similar in their “engineyness” but have different build paths, payloads, methods of deck control, etc. So that’s my two cents on what I’ve learned from this survey. I welcome comments on it, and especially ideas for how to organize content that addresses these topics in a way that can be beneficial to lots of people who want to break through to the next level of Dominion play, whatever that is for them. I’m still trying to wrap my head around this “card value property” as it represents a new way of thinking about Dominion decks that I’ve never really thought about before. This entry was posted in Dominion, Tabletop Games on August 1, 2018 by Adam Horton. 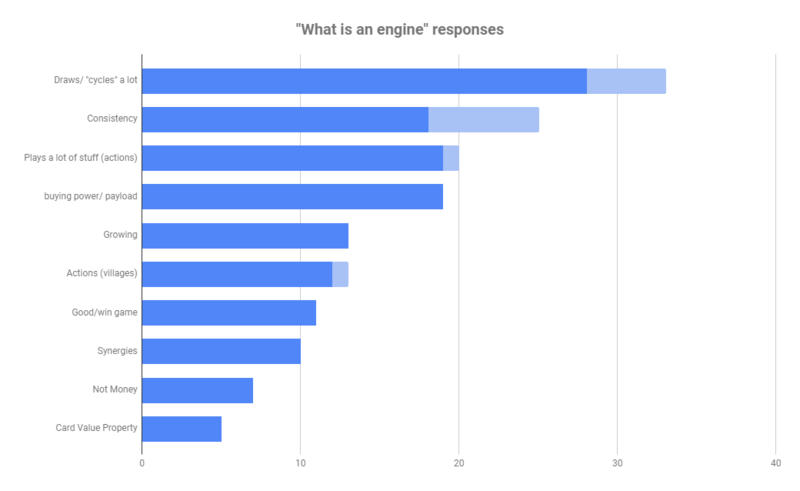 When I responded to the survey, I was trying to identify the “essence” of an engine–that is, a small set of properties of an engine that imply all the other properties. This is quite different from trying to give a pedagogical definition, and I suspect that my definition would be not at all useful for that purpose. If the survey asked people how they would explain what an engine is to a new-ish player, I wonder if the answers might be just a little more consistent. Hey maybe you could use your survey to identify what the hell people mean by “consistency”. So yeah, I wasn’t quite sure what I was looking for when I started the survey, and these ideas are sort of a natural direction to go in if more clarity is needed. Wrapping my head around “consistency” is certainly on the list. Pingback: Dominion: What does it mean? | Wake up, Meeples!